Blue corn. 100% corn in the mashbill. The whiskey (not the grain) is smoked with Texas scrub oak. Color: Amber with henna tints. A rich and lovely hue. Nose: big intense putty mineral phenol aroma with a powerful sweet aspect; an almost desitin-like sweetness. A bit more nosing reveals mesquite, chaparral, and sugar. There's wood here like sawn pine, but with less resin. There's also distant smoke and char. Entry is intense with powdered confectionery sugar. There's an ivy herbal note in the sweetness of the entry. Big expansion with plenty of spirit heat, an earthy raw corn flavor and then mesquite shrub, pungent as exotic incense, joins the sweetness and smoke. The sweetness, and ivy herbal note and smoke get big in the midpalate and stay big in the finish. There are tannins in the finish, but they are subsumed under the brush smoke sugar fest. The finish is vastly long - but ultimately simple. Sweetness and herbal scrub oak smoke pure and simple and lingering on and on and on. The sweetness that stays and stays is unusual feature here. It's richly flavored and certainly distinctive. The giant flavor profile is utterly new, completely American (and specifically Texan). Terroir is all over it: it smells and tastes like a sweet wooded pecan pie made from a West Texas brush fire. Genuine, unique, and big - but is it delicious? Some might say so - but my guess is the majority will not. Personally I'm on the fence. I want to pair it with barbecue. There is clear quality and crafting going on but I miss some measure of complexity in the flavor profile. I also find the nose - intensely sweet smoked as it is - on the edge that divides compelling from aggravating. It's an utterly new and original flavor profile that's intense and distinctive. I might grow to love it or it might get fatiguing. I'll have to keep at it and update this after extended experience. In the mean time I have no problems recommending this as a whole new flavor profile for the gustatory thrill seeker daredevils out there. Given the crafting and level of originality I'm anxious to try the other Balcones expressions. UPDATE (June 9, 2012): As I continue to drink Brimstone my opinion continues to improve. Really a lovely and unique flavor profile. I now rate this 4 stars. Intensely smoky and sweet, with and earthy and rich blue corn flavor beneath. Obvious crafting, and surprising refinement. A bit of air and some sense of familiarity helps with the appreciation for something utterly new. UPDATE2 (September 2, 2012): With time I have come to passionately love Brimstone's unique flavor profile. I find that it is incredibly useful to me as a whisky enthusiast. First of all, it makes amazing cocktails. A Manhattan or Old Fashioned made with Brimstone is utterly distinctive and always sparks a big conversation. Secondly Brimstone pairs incredibly well with high end dark chocolate. Thirdly, the big big flavor of Brimstone stands up to and in some ways out classes huge peat monsters like Octomore. I find that when I put Brimstone into a master class or a flight of whiskies I must always put it last - even after Octomore - because even though it isn't as hot from the palate burn perspective, it is a bigger flavor over all when all areas of the palate are considered. And finally, Balcones has become iconic of what's going right in the American craft distilling movement. I find that when trading with other whisky enthusiasts, especially ones from overseas (where Brimstone is difficult if not impossible to get) they very often ask for a sample of Brimstone. This makes it vital trading fodder for me (because, trust me, overseas they have access to a lot more interesting whiskies than we can get in the USA) - and also a wonderful spark point for additional whisky conversations. This is a tale of accommodation for me. Initially unfamiliar, I gave Brimstone 3 stars. Over time I moved it up to 4 and now finally 5 stars. A number of factors helped: time and oxidation helped open up my bottle. I had the opportunity to try a very special version of Brimstone: Cask 1200 aka "The Burned Barrel". This intense version of Brimstone helped deepen my appreciation for the odd, intense, flavor profile. Finally, I just drank it enough to become fully acclimated to its power and then fell in love. I now cannot imagine always having a bottle on hand. This is a perfect example of where reviewing from a small sample doesn't cut it. Having the full bottle allowed me enough time and experiences with Brimstone to experience a full conversion. 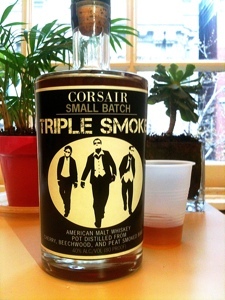 Corsair Small Batch Triple Smoke. Batch 40, bottle 287/306 40% abv. This is an American malt whiskey - composed entirely of malted barley. That's unusual - but not as unusual as the triple smoke concept. The malts are smoked over 3 different fuels: peat, beechwood, and cherry. That's the hook that got me; it sounds bloody brilliant. There's no age statement. Corsair operates out of both Kentucky and Tennessee. 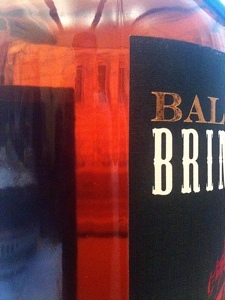 Oddly, the bourbon blog review is of a barrel strength version at 59.2% abv. My sample, like Strenio's is diluted all the way to 40%. Color (in the bottle): lemonaid mixed with iced tea (cloudy). In the glass - amber with copper tints. Entry is soft and gentle with a rice-wine sweetness. As the palate expands I get a rich complex of odd flavors: rice, fish, malt, sulfur, and finally smoke. 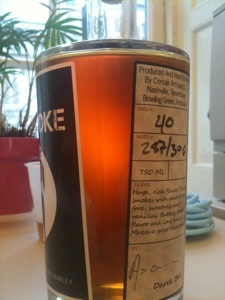 But the smoke is gentle and deeply integrated into the body of this malt. The finish is more obviously smoky but stays sweet. The sweetness lingers with cherry notes and toasted char - tannins growing, but never overwhelming the smoky sweetness which lingers on until the bitter end and beyond. There is an unbelievable length of finish with this whiskey. The odd sweet smoky rice wine fishy aspect just stays and stays. Something about this odd constellation of flavor notes puts me in the mind of extremely young partially aged new make. The back label says "Makes a great Manhattan. Also great for sipping neat." You gotta wonder when the label itself suggests mixing first. Frankly I'm torn. I found Triple Smoke's flavor profile strange and a bit off-putting. I also found it a bit young and raw feeling. Yet, it's so different, so utterly new and distinct that I can't seem to help but admire it for Corsair's audacity. I think Corsair clearly has great potential - especially given their wide array of other interesting and experimental spirits. The sweetness in the finish and the odd smoky flavors are a common thread in these two otherwise divergent distillates. They also share distinction by being completely original and iconoclastic - proof that the US craft spirit movement is the Wild West where anything goes. Frankly, however, neither is anywhere near as smoky as any of highly peated Islay malts. These are sweet and lingering wood smoke flavors. Bottom line - the Balcones Brimstone succeeds and Corsair Triple Smoke does not. Fantastic choice of topics, and those each sound ... interesting. Love the new domain also! Thanks for the kind words. I've been enjoying your tweets and the comedy of your recent posts. I'm new on twitter too. It's a riot. These smoked whiskies were definitely weird and - at least to an extent - wonderful. I need to find the best way to use them. The Triple Smoke may, indeed, have to be mixed. 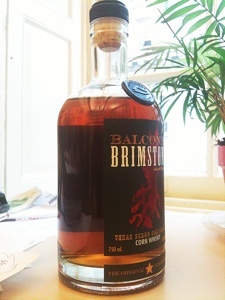 I get the feeling the Balcones will keep changing with exposure to air as the bottle is consumed (and my palate adapts). I'll definitely follow up. I didn't like the Triple Smoke very much either... though you were much kinder to them than I was. I have a few other friends who swear it was awesome, though. I'm wondering if they didn't have much earlier batches. Mine was in the early forties closer to yours.